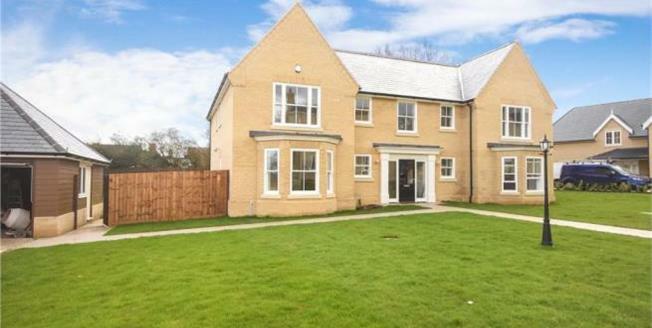 An extremely spacious five bedroom detached executive residence, nearing completion, on this impressive gated new development of just five properties in the picturesque village of Purleigh. Featuring a kitchen/family room with bi-fold doors, utility, two reception rooms, large study – impressive oak staircase leading to a glass galleried open plan landing area, master en-suite bedroom with a vaulted ceiling, further en-suite and family bathroom. High specification includes a bespoke kitchen by Nicholas Anthony with Siemens appliances, underfloor heating, porcelain and oak floor finishes to hallway, remainder fully carpeted, kitchen and bathrooms, Oak staircase and contemporary oak doors, Indian sandstone patio and detached double garage. The location offers undulating countryside with views over the River Blackwater with a village store, post office, florist, three pubs and a beautiful 14th Century church. New Hall Vineyard is opposite the development. Nearby also is Danbury village, excellent schools and mainline rail services at Chelmsford (Liverpool Street) and the riverside town of Maldon just 5 minutes approx. by car.